I was born and raised in Johnston City, graduating from St. Paul's school in 1978 and Johnston City High School in 1982. 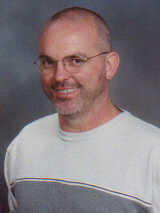 I have been a teacher at Johnston City High School on and off since 1988. I graduated from Southern Illinois University in 1986 with a Bachelor's Degree in Elementary Education. I received a Masters in Integrating Technology in the Curriculum through Walden University. My first teaching job was at the high school, so I went on to get my secondary certificate as well. I have taught all grades of English at the high school. This year starts a new beginning for me. I have decided to go back to elementary education, and I will be teaching second grade at Jefferson School. I look forward to going back to my roots in education, it will be a big change but it is one I am looking forward to trying. I have a variety of hobbies. I enjoy going to the movies and the theater, reading (non-fiction is my favorite), writing (I've spent years working my autobiography), traveling and collecting (my favorite things to collect are metal lunchboxes and Disneyanna). . Thanks for stopping by my webclassroom, keeping checking in because things are always happening around here!